WooThemes, one of the largest theme providers for WordPress sites, today launched WooCommerce, an all-new plugin application and library of integrated themes that help individuals and businesses turn WordPress sites into simple, elegant and fully-customizable e-commerce offerings. WooCommerce is the best way for businesses to quickly build professional shopping sites with world-class designs and powerful, customizable features. Rather than paying a fortune for an old-fashioned e-commerce CMS, or a newer hosted service that requires outside expertise to implement, individuals and businesses can now use WooCommerce to build WordPress-powered shopping sites without the headache and hassle that such projects typically entail. WooThemes, founded over 4 years ago, has amassed 50,000 paying customers, and its free themes have been downloaded more than 800,000 times. WordPress itself currently powers 22% of all websites in the US. WooCommerce is the first of a longer line of forthcoming products that leverage WooThemes for end-to-end WordPress development. It is also the first product from WooLabs, a new division at the company created to innovate new products and extend WooThemes as a platform. With WooCommerce and WooLabs both, users can expect the same top-notch design quality that WooThemes is known for, as well as a powerful line of new applications that take our idea of themes to a new level. 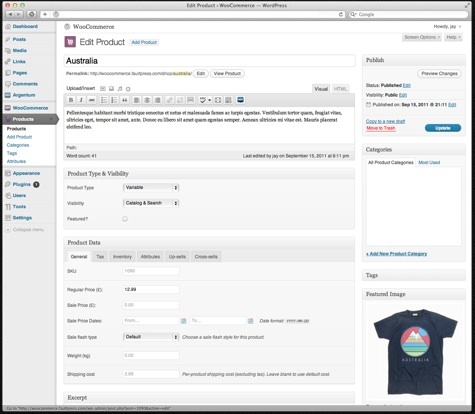 The WooCommerce team is working on one-click integrations between existing themes and the new WooCommerce plugin. Statua is already integrated with WooCommerce to allow photographers to sell their prints online. Similarly, the Diner theme will soon be integrated with WooCommerce, allowing restaurants to accept take-away orders via their website. The SupportPress theme will be integrated to allow anyone to sell premium support of any kind. The approach of not only building the back-end platform, but also carefully integrating successful themes means WooCommerce can have a huge impact on any businesses looking to improve their ability to grow sales on the Web. The expert integration of the right theme with the e-commerce platform makes it dead simple for a business to start making more money online, without having to take the one-size-fits-all approach of other commerce platforms. WooCommerce is available for download today. The WooCommerce code is open source and can be found at http://woothemes.com/woocommerce. Founded in July of 2008, by Adii Pienaar, Magnus Jepson and Mark Forrester, in three different countries, WooThemes is the best place to find beautiful, professional themes for WordPress sites. Created by some of the world’s most talented designers and developers, the WooThemes ninjas, WooThemes and WooCommerce help people and businesses get professional quality WordPress sites launched quickly, with the features, customizability and performance they need right out of the box. For more information, visit http://www.woothemes.com.